Lichen planus is a fairly common skin disorder that is characterised by itchy, non-contagious. The disease can be seen on both skin and mucous membranes and is frequently treated by our London dermatologist, Dr Daniel Glass. Lichen planus on the skin appears as flat topped reddish purple bumps often with a degree of surface scale. Lichen Planus can affect the torso and limbs, the extent of disease is very variable, the wrists are commonly affected. Oral lichen planus, on the other hand, appears as white dots or lace like white patches on the inner cheeks, tongue, gums, or lips. Lichen planus affecting the nails cause ridges to develop on the nails. The nails also become thin and prone to splitting. Lichen planus can causes inflammation of the scalp which can in turn effect hair growth. According to skin doctor Dr Daniel Glass, the cause of lichen planus is unlcear. Some scientists think it has autoimmune origins, but this theory needs more study. 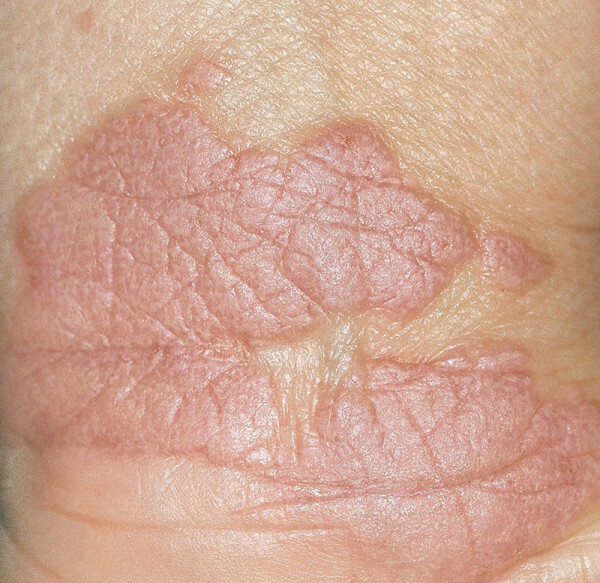 Some drugs can cause lesions that look like lichen planus. Rare cases of oral lichen planus are associated with metal fillings. Experts are also looking into the possibility of connection between hepatitis c and lichen planus. Dermatologists often diagnose lichen planus by from the appearance of the rash. When it’s not clinically obvious a skin biopsy may be required. Lichen planus does not always need treating, this depends on how extensive and symptomatic the disease is. There are a number of effective treatments but no cure, the condition tends to resolve spontaneously with time. Localised and bothersome lesions can be treated with topical steroids and occasionally with steroid injections. Doctors prescribe antihistamines to reduce itching. Use of Phototherapy (light treatment) is not uncommon. Oral lichen planus can be more difficult to treat and may require oral medication.